Posted by Luke Benson on Sunday, May 31st, 2015. I’ve just gotten back from doing TouMazing in Stavanger and that was brilliant. Praise most high to Chi Ton and all the Comedy Box Massive for making that work. Before that it was Australia (mainly Adelaide, thanks to Dan Willis and HaHa Comedy for that. Props also to the Aussie comics for consistent level of sledging that had me very close to calling Childline). 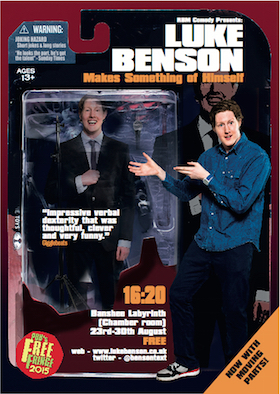 At present all roads (conversations) lead to Rome (Edinburgh), I’ll be at Banshee Labyrinth at 16:20 with a new show that’s a good amount of fun now and should be a Jokernaut come August. Formerly known as “Working Men’s Club” is on hiatus having enjoyed it’s third attempt at Edinburgh success. We’re relocating to a new London venue hopefully in new year & will be appearing throughout the country at various festivals; dates to follow. Our bodies couldn’t handle it. Go to the WMC tab for more details, or just send an email here if you’re interested in having WMC come to your event or venue. Each week of the season he & other Toon-following comedians & celebrities/members of the public chat about all things around St James’s Park. Here is my voice-reel. I’ve voiced a couple of national adverts & can be hired through here. By Luke Benson on Sunday, May 31st, 2015. To be kept informed of all Benson news & Working Men's Club info, pop your details in here!